It’s time to answer the age-old question: How Should an Overcoat or Peacoat Fit? Alright, maybe it’s not age-old, but it’s still important either way. The rules are very similar to how should a suit jacket fit but keep in mind, with an Overcoat, at least, you’ll usually be wearing a suit or blazer underneath it, so the size will need to adjust accordingly. When trying on Overcoats, make sure you’re wearing a proper-fitting suit jacket or blazer so you can see how it’ll really fit. Trying on an Overcoat with just a shirt underneath will likely result in getting one that is too small and will look horrible when you’re wearing it with the proper clothing underneath it. Also, when trying on a Peacoat, make sure you’re NOT wearing a suit jacket or blazer underneath, because like I said in my Overcoats & Peacoats essential article, this coat is not meant to be worn with those items. Like with almost all your clothing, your coats can and should be tailored, but you always want to make sure at least the shoulders fit, because it’s very difficult and costly for a tailor to fix these, if they can at all. How Should An Overcoat Fit? 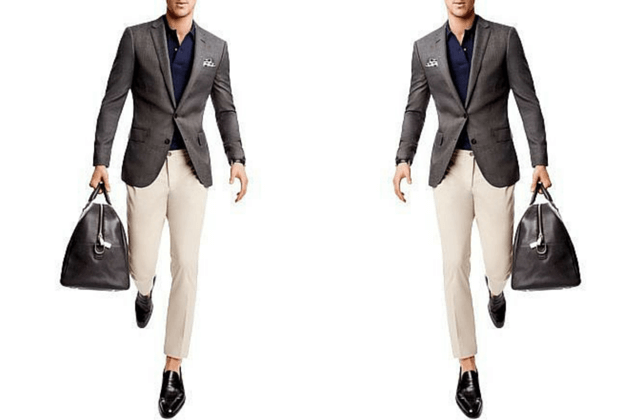 Even though this will be going over a suit jacket or sport coat/blazer, you still want the shoulder seams of the coat to end where your shoulders end. If the shoulders are too tight or loose, they will be very hard to fix at a tailor’s. You should see no divots or wrinkles in the shoulders, as well. If nothing else, the coat’s shoulders should fit perfectly. With your arms straight down, bend your wrist, so your palms are facing the ground, the sleeves should lightly touch the top of your hand. This length will cover anything you’re wearing underneath – which is what you want with a coat. The picture below is from my How Should A Suit Fit? article, but I wanted to show you what I’m talking about when I mean palms facing the ground. Where the white shirt cuff is hitting is where your coat sleeves should be hitting. Just enough to cover it, basically. When buttoned, the coat should not be roomy, but should lie close to your body. That being said, it should be in no way taut or feel constricting on your chest or midsection when wearing it over a suit or blazer. 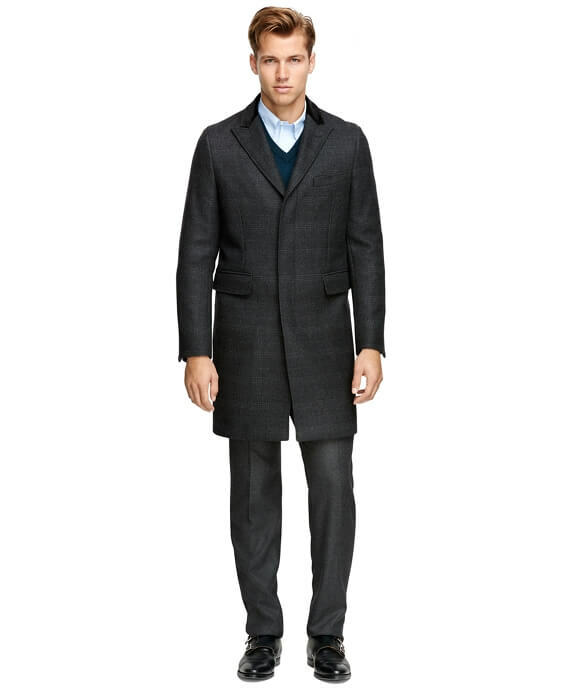 This picture below (of the same coat my model is wearing, by Brooks Brothers) perfectly illustrates how it should fit in the body. He’s only wearing a sweater and Oxford dress shirt underneath, so it’d fit a little tighter in the body if he had on a suit or sport coat/blazer. For Overcoats, the lapels are pretty standard width, so this is a non-issue. The lapels on the Brooks Brothers Overcoat above are a little wide, but they’re still very acceptable. How Long should an overcoat be? No matter what climate you live in, it should end somewhere above your knee – never longer. A good rule of thumb is mid-thigh to just above your knee is where your Overcoat should hit. If it needs to be longer because it’s too cold, then it’s time to throw aesthetics/fashion out to the window and go full Constanza Gore-Tex. How Should A Peacoat Fit? Just like with Overcoats, you want the shoulder seams of a Peacoat to end where your shoulders naturally end – where they start curving down to your arm, basically. You should see no divots or wrinkles in the shoulders anywhere. The shoulders should lay perfectly flat, with no divots or rumpling or pulling on the shoulders. If you have more rounded shoulders, the seam should still end in the same place. If the shoulders are too big or small, a tailor will have a very hard time fixing this, and it would be very expensive – if it was even possible. So ensure these fit properly before buying your peacoat. RealMenRealStyle has this awesome graphic showing the proper shoulder fit. Even though it’s for suit jackets, your Peacoat shoulders should still look like this when the jacket is buttoned. 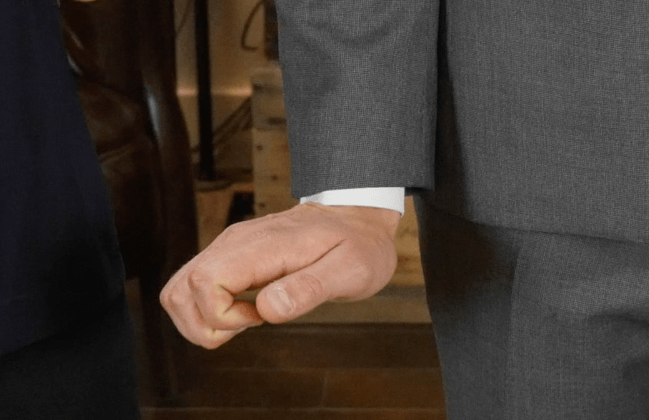 Just like an Overcoat: With your arms straight down, bend your wrist, so your palms are facing the ground, the sleeves should lightly touch the top of your hand. 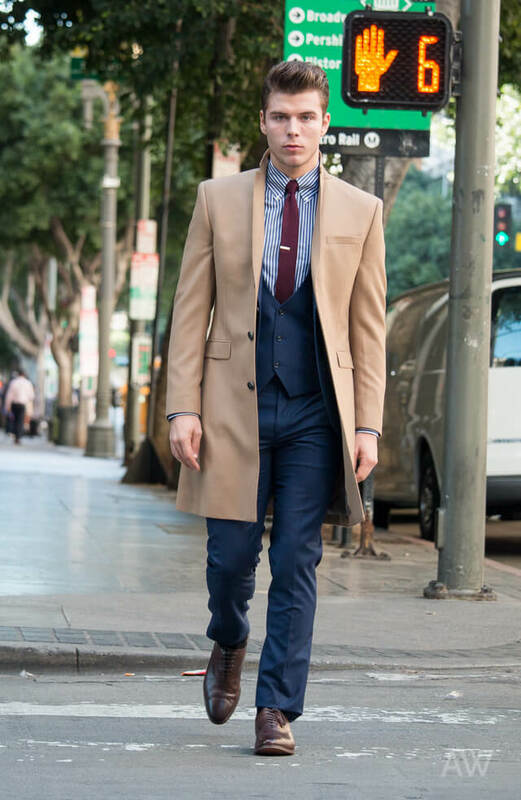 This length will cover anything you’re wearing underneath – which is what you want with a Peacoat. The picture below is from my How Should A Suit Fit? article, but I wanted to show you what I’m talking about when I mean palms facing the ground. Where the white shirt cuff is hitting is where your Peacoat sleeves should be hitting. Just enough to cover it, basically. When buttoned, the jacket should lightly hug your midsection, but not feel tight or constricting. There shouldn’t be a whole lot of “play” if you were to put your hands in the jacket and pull forward. The jacket shouldn’t be pulling at any of the various buttons on the front, making any creases in the front. If it’s very roomy around your stomach/waist area, you can (and should!) have a tailor take in the sides so it fits properly. Remember: better to be slightly too big than too small. Quick Tip: When wearing your Peacoat, leave the bottom two buttons unbuttoned. It allows the coat’s bottom to flow better when walking or sitting. Buttoning a Peacoat all the way down is very odd looking and never done by anyone but a rookie. For Peacoats, the lapels are all standard width, so this is a non-issue. 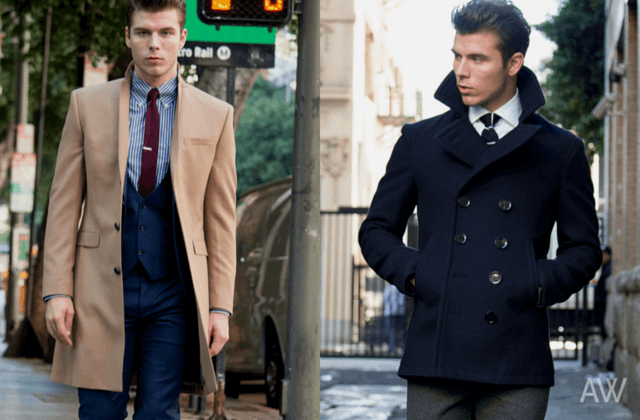 How Long should a Peacoat be? 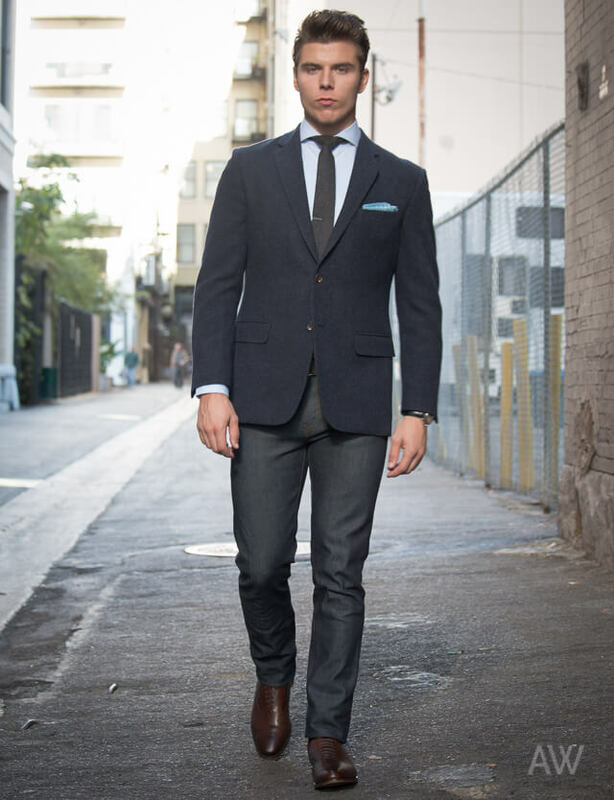 Unlike the Overcoat, a Peacoat should hit anywhere from mid to lower crotch. On my model, above, the Peacoat ends right around lower crotch. Anything longer than that wouldn’t be acceptable. 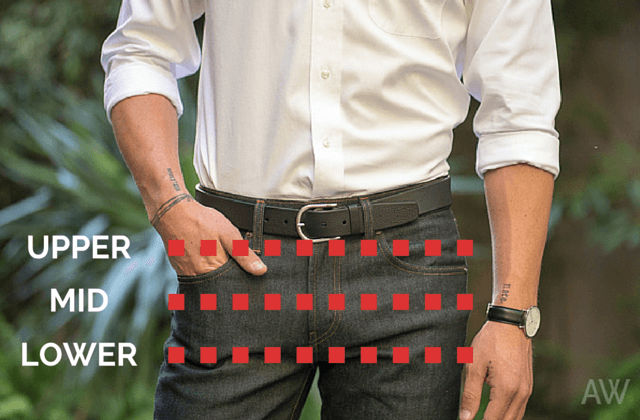 Anything longer than lower-crotch or shorter than mid-crotch would throw off the proportions of your body and make you look weird. Balancing proportions is a mistake a lot of guys make and can really influence how big or small you look in clothing. Check out my Men’s Overcoats & Peacoats essential article for my favorite coats for men of any age or body type and the different ways to wear your Overcoat and Peacoat. 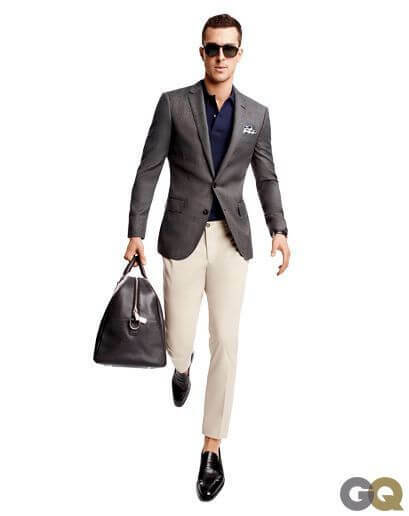 They’re tough to keep clean, but white chinos are a great warm-weather outfit and easy to pair with items in your closet. Wear with a tank or t-shirt, chambray button-up shirt, or with a sport coat. Also, this is one of the few times I’m going to get behind sandals. I love these white chinos with dark brown leather sandals, particularly the ones by AllSaints (see below). If there’s such a thing as “non casual” sandals, these are it.